This week was a little big. I need to stay away from the stores. There was a lot of clearance including Halloween candy, pico de gallo, applegate peach jerk sausages, organic cottage cheese, Earth's Best crackers for baby, puree pouches for baby, silk yogurt cups, almond milk yogurt cups, baby puffs, baby yogurt, lunchmeat, apples, & jars of baby food. I went to buy a pizza (not pictured), creamer, & fruit (I ended up with bananas & organic pears). I also picked up daiya cheese & dye free Darigold cheddar since they were reduced price while I was walking by. I spent $67.34. I went to Costco Tuesday and picked up parmesan & eggs, but couldn't find the corndogs I wanted. I also bought some cheese, granola bars, & organic fruit snacks. I spent $52.75. My friend is part of a gleaning ministry & she called me Tuesday & said to come pick stuff up. Lots of gluten free tortillas, gluten free cupcakes, organic lettuce, two asian chicken salads, 2 cans of formula, & very ripe organic bananas. Free. I was at the store again on Wednesday - this time Fred Meyer. I was there for milk & potatoes but found way more, of course. 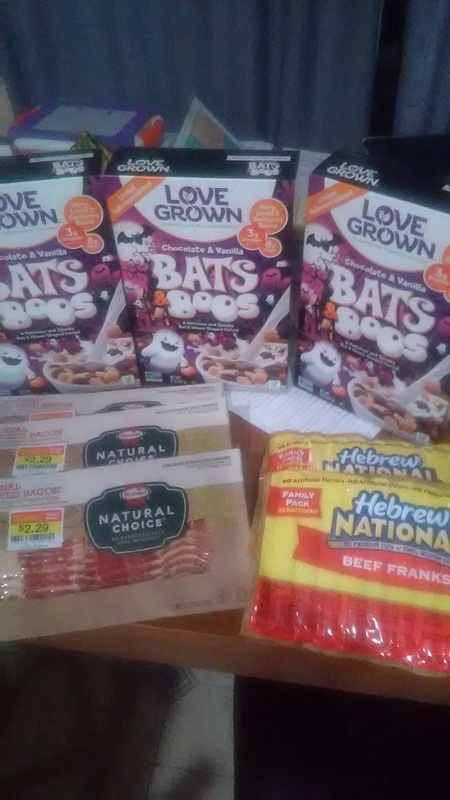 I picked up corndogs, almond coconut milk since DD2 was running low, nitrate free bacon, organic half & half, organic yogurt, alexa fries, & a little bit fruit with bananas, mangoes, & apples. I also found brick daiya and on clearance baby food & lunchmeat. I spent $55.70. I actually skipped a day at the store Thursday, but was at QFC Friday for a date with a kiddo & just dashed around the clearance areas. I found a bean-based cereal on clearance because it was Halloween themed. 3 of the 4 kids liked it. I was cracking up at the name: Bats & Boos (Booze). I also found some nitrate free bacon & Hebrew National hot dogs on clearance. I spent $25.11. And finally, I was at Fred Meyer on Saturday to catch the tail end of their sale. I bought organic potatoes, organic milk, organic salad dressing (on clearance), bananas, bread, pepperoni, and two pizzas. I found some clearance apples & romaine heads in the produce clearance. I spent $27.71. Oh my goodness! I was at the store 5 days out of 7!